Your wife or girlfriend has probably asked you a million times what it is you want, and maybe you're having a hard time thinking of something that you really want. I know how it goes. All year long you see or think of something that would make your life so much better, and then when it comes time to recall these things, your mind goes blank and somehow your life is fine just the way it is. Well, your girl has to get you something so let me help you, help her. You've been asking, and asking, and asking but he doesn't know what he wants. He wants you to surprise him. . . that's where I come in. When my wife asked me what I want this Christmas, I was prepared with a list of 20+ things. I am not ashamed to admit that there are some way cool things out on the market that I would not mind getting my hands on. If my wife is going to spend our money on a Christmas gift for me, it had better be something that I really want. I know my wife is capable of coming up with a cool present on her own. I just fear that if I don't nudge her in the right direction, I'll end up getting ankle socks and bright colored V-Necks [shiver]. So here's my [extremely unrealistic] Christmas List. Chances are your man does not have every item on this list (if he does, you should be giving to charity this year), so take your pick. I'm sure he'll love it! I've broken my list down into categories. Feel free to skip ahead by clicking on a Category. If you or your man are the gardening type, here are a few gift ideas that should come in handy. 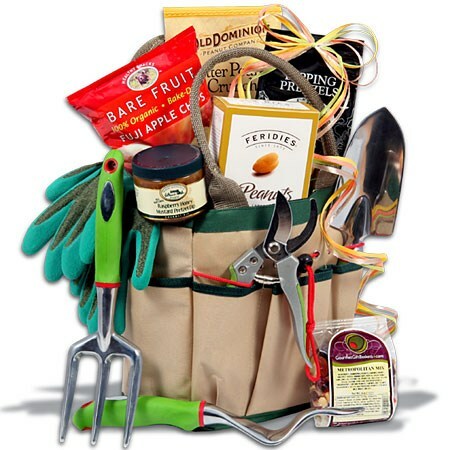 Chalk full of everything a gardener needs, this basket has seeds, gloves, a shovel, pruners and more. Even if you or your man has considered taking up gardening, this is a great way to get your foot through the door. I know I have been wanting to get serious about a garden of my own. Gardeners always appreciate seeds. You can never have too many seeds. So if nothing else, fill your man's stocking with all kinds of different seeds and maybe surprise him by cleaning his old gardening tools if new ones don't fit the budget! If you're willing to pay a little bit more for a gift that is going to leave your man speechless, consider his lawn equipment. Is he still using a Push Mower or sweeping the leaves and debris with a silly old broom? How about a new Lawn mower or a gas powered Blower? If he's using an electric trimmer or "weed wacker," get him a batter powered one that will make the job that much easier. If he's already got all the top-of-the-line products or you can't afford a 200 dollar leaf blower, consider a new Sprinkler Tool Set. Here is where you can get a complete sprinkler tool set. 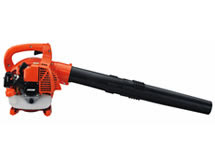 When it comes to edgers, blowers, and chainsaws, ECHO is known for making great, reliable, and quality products. Take your pick! All would make excellent gifts for a man that likes to get his hands dirty in the yard! It's hard to find a gardener who doesn't also enjoy watching the birds, especially in winter when visits from cardinals, goldfinches and chickadees add some much-needed color and excitement to the yard. A nice Bird Feeder is an excellent gift that any gardener is sure to enjoy! 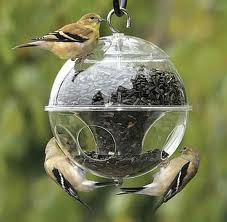 Or, if you already have too many bird feeders, Bird Seed makes for a great stocking stuffer! A nice bird feeder and a few packets of seeds are the perfect combination for a Happy Christmas! BirdFeeder.com has some pretty cool bird feeders. PetSmart has a 20lb bag of Wild Bird Food for 14 bucks! Here are some more Green Thumb Gift Ideas. I, like most guys, am a huge fan of technology. Gadgets and gizmos get me goin. 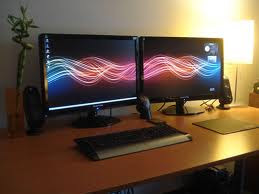 If your husband works in an office where he sits at a computer most of the day, you can't go wrong with getting him an additional computer monitor. You can find some under 100 bucks at places like Wal Mart, but some of the nicer ones are not going to be much more than 100 dollars. His computer might not have two monitor ports so you might have to spend an extra 25 dollars on an adapter. On Amazon, 117 dollars will get you a really nice eMachines monitor and an adapter that lets you plug the 2nd monitor into a USB port. A remote controlled Helicopter is at the top of my list this year. 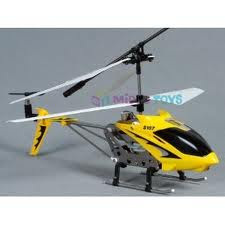 All boys ages 5 to 55 want a remote controlled Helicopter, trust me. They are so cool! They fly in the air which means you can chase your dog, drive them into people and things, and land them in cool places [with practice] like the tops of ceiling fans and stuff! How cool is that? A word of warning: If I were you, I'd do a ton of research before dropping any money on a helicopter. 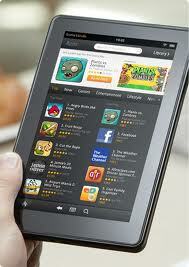 Read all the reviews you can before settling on one. A helicopter that costs less than 50 bucks is not going to last 30 days. If you're going to get one, get a good one. I could spend hours in Lowe's or Home Depot just looking at tools. Brand new tools are so beautiful, manly, new, and new. There is nothing better than new tools. Sometimes I get tired of "jimmy-ing" things in order for them to workout. If I'm going to do a project, I love when I have all the appropriate tools to get the job done right. 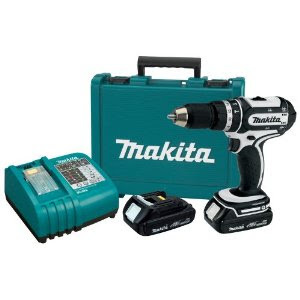 Show your man you love him by getting him tools. These two words describe a real man perfectly: Power and Drill. A drill like the one you see to the left is at the top of my "Mr. Fix-It" Christmas list because it is awesome looking, reliable, and the perfect size. Some guys want one of those heavy duty drills that you have to hold with two hands. But you really can't go wrong getting him a drill of this size. But, if he already has a nice compact drill, get him an upgrade; a bigger one. And Visa Versa. The tricky part about giving your man a gift like this, is that he might prefer a different brand than the one you pick out. I would recommend just getting him a 100 dollar Gift Card to either Lowe's or Home Depot, or somewhere inbetween. That way he can have the honor of seeing the one he wants on the shelf, picking it out, and taking it to the cash register. Nothing can make anyone feel more like a man than buying a brand new Power Drill. Here is where you can buy the Makita Power Drill displayed in the image above. Personally, I think Tool Belts are a bit under-rated. Everyone assumes they are only for guys that work in construction. But I was hanging Christmas Lights the other day and was thinking about how nice a little tool belt would be. Whether I'm hanging lights, pictures, or whatever, I'm always putting nails and screws in my mouth because I have no other place to put them. I'm always having to get down from the ladder so I can grab my hammer, drill, etc. A lightweight tool belt that fastens around my waist quickly and painlessly would solve so many problems! I do not think that I am alone in this thought. 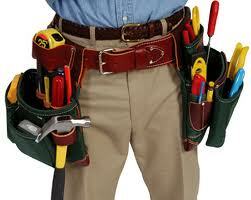 Maybe you or your man has not realized how handy a tool belt would be. 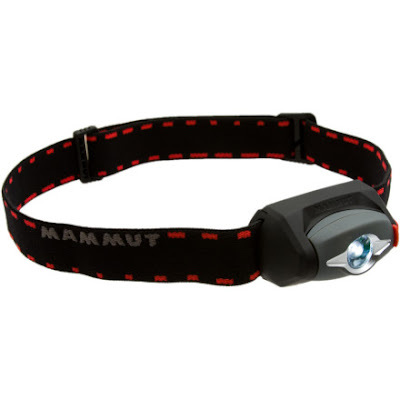 So surprise him and get him a cool looking utility or tool belt this year! This is the kind of belt I'm talkin about. Lightweight, cool looking, and affordable! Right now it's 30 bucks off, on Amazon! Here are some more tool belts and bags.. A tool bag would be a good gift, too! If you or your man already has a belt. Headlamp - These are super handy especially when working on cars, in dark areas, and at night. You can get these just about anywhere, even Wal Mart. Here is one that I really like. Drilling and Driving Bits Kit - Kits like this one by DeWalt have all the attachments you will ever need for a drill or hand driver. Look for the magnetic ones because they are the bomb! Staple Gun - If your man is a true Handyman, he already has a staple gun. But does he have TWO staple guns?? Because they are so useful, especially at the darndest times, keeping one in the toolbox at home and the toolbox in the car(because every handyman has a toolbox that he keeps in his truck or car). You don't have to get a really fancy staple gun, a simple one like this will do fine.